As we noted in Part I, conifers provide the vast majority of golden winter foliage, especially in colder zones. Anyone who thought that ‘conifer’ was synonymous with ‘Christmas tree’ should have a new idea from our photos of the numerous golden varieties lighting up the winter landscape. 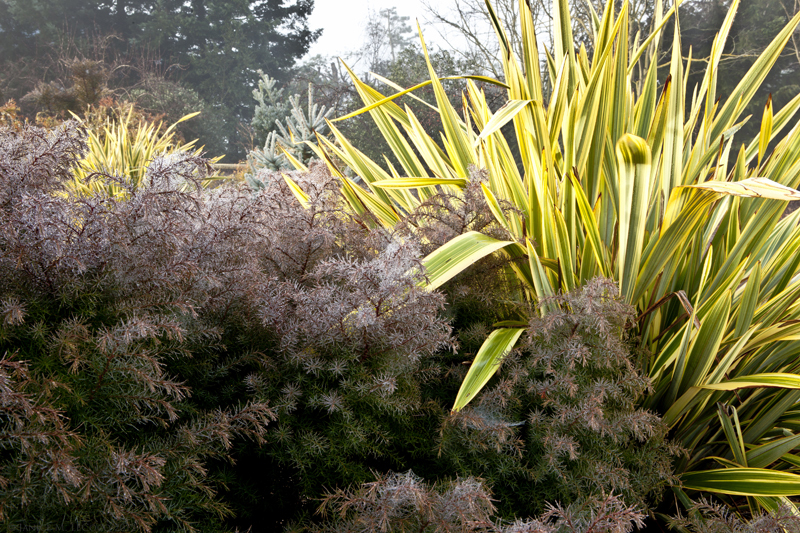 However, even those of us that use conifers extensively in the garden enjoy the variety of texture and shape that other plants provide, so here we share those that add a golden glow without the needles. 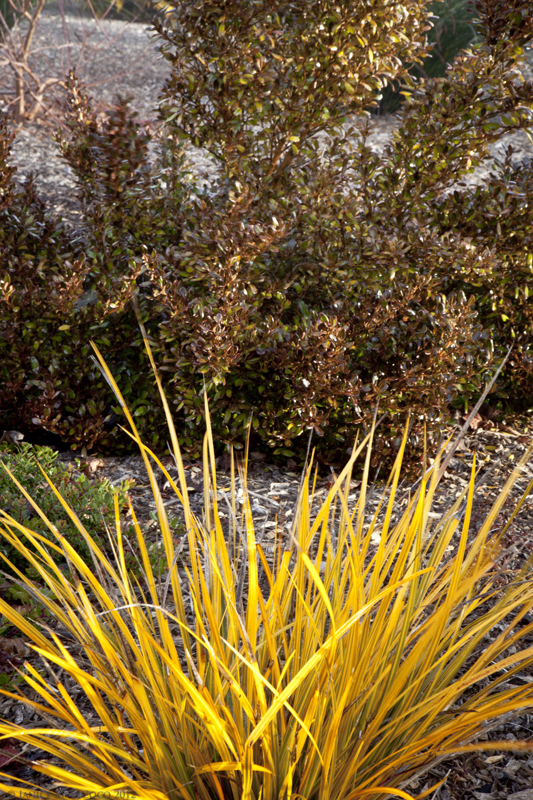 In USDA zones 8-10, Phormiums add color and drama to the foliage garden. Many of us have a love-hate affair with the genus, as Phormiums are the over-used, poorly maintained staples of many commercial plantings. In addition, many grow far larger than their tags indicate and reversion to the green is deplorably common in the most attractively colored varieties. In fact, one plantsman we know is fond of saying that if you have a colored Phormium that hasn’t reverted, you just haven’t had it long enough. Happily, a few varieties manage to transcend the sins of their relatives and perform as good garden citizens, and one is P. ‘Golden Ray’. True to its name, it provides a ray of sunshine in the winter landscape, doesn’t get enormous and, at least so far (it was first grown in the U.S. in 2006), appears to be stable. An added benefit is that it is easy to groom, as the old blades can be tugged gently for removal, rather than requiring weaponry to dislodge them. The strappy leaves provide wonderful contrasting structure to the softer, more rounded shapes of the conifers. 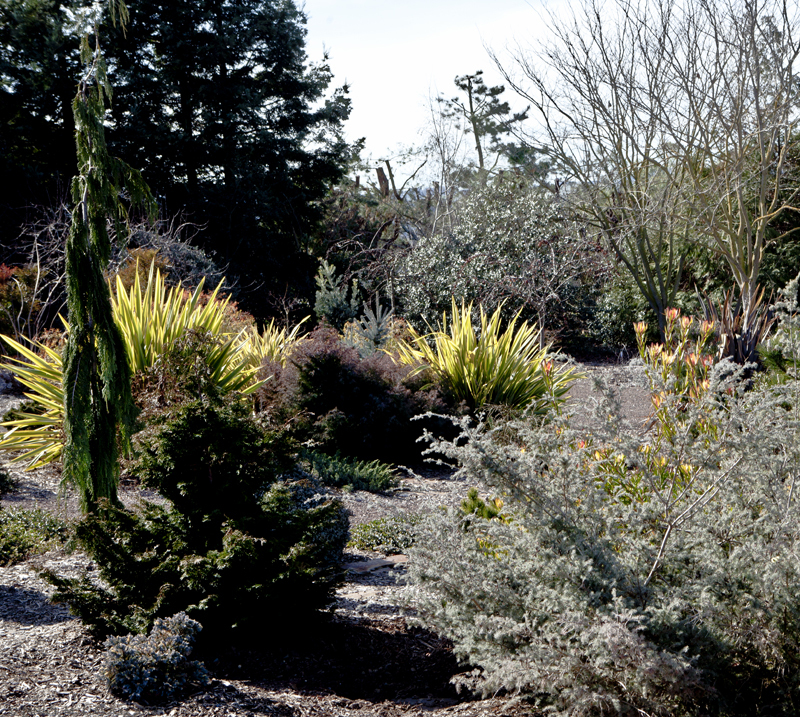 Yuccas also add sunshine to the winter garden, with structure similar to Phormiums. They are related, although not as closely as they were once thought to be, when both were in the Agave family. Phormiums have recently been moved into a family of their own. 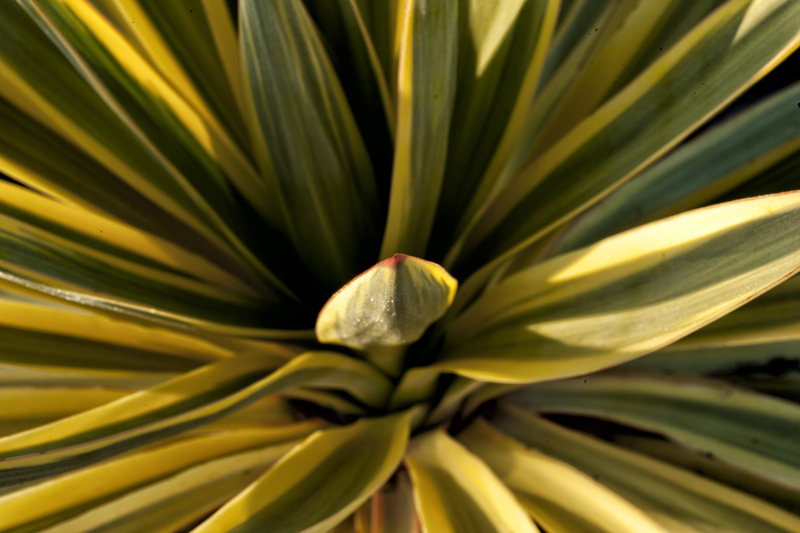 Yuccas come in a variety of greens and golds, and our favorite is ‘Walbristar’, patented and sold in the U.S. as Bright Star. In summer Bright Star is crisply green and gold, but colder winter temperatures bring out a pink blush. It is a strikingly beautiful plant. Pam Pennick, of Digging, reports from Zone 8b that “‘Color Guard’ yucca looks great year round and is a nice medium size that doesn’t try to swallow a garden.” She also likes ‘Bright Edge’ and we love ‘Tiny Star’. If grass-like leaves are not to your liking, or your winter temperatures are too low for Phormiums and Yuccas, Abelia Kaleidoscope is a wonderful choice. This A. grandiflora variety is much more compact than the species and has buttery golden winter foliage with highlights of red, orange and chartreuse. It grows beautifully in Zone 9b and is evergreen to Zone 7. 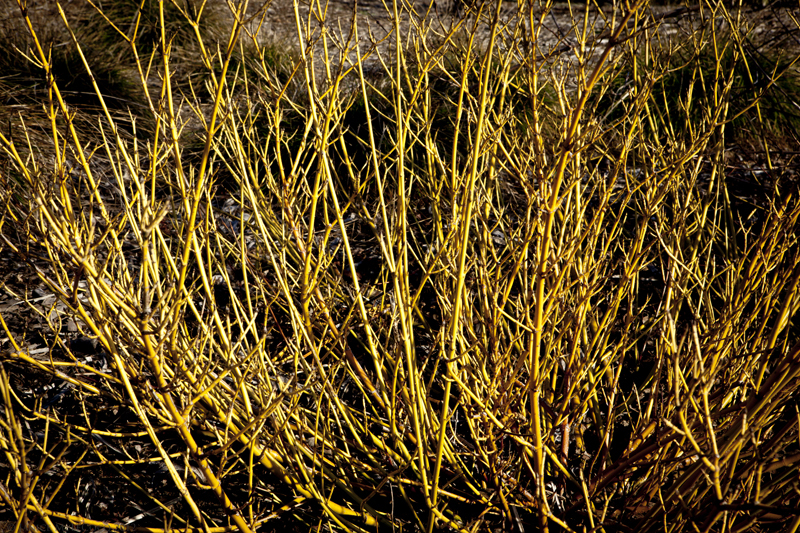 This is one of our favorite shrubs year-round, and it can take full summer sun here without burning. The shadier the spot the greener it grows, so for maximum sunshine in winter, plant it in full sun or under a deciduous tree. See how well ‘Kaleidoscope’ pairs with greens and reds? Its compact form means low maintenance, although it can withstand shearing if it gets rangy. We read a lot about red-twigged dogwoods and don’t understand why their yellow brethren don’t get more respect – or attention. 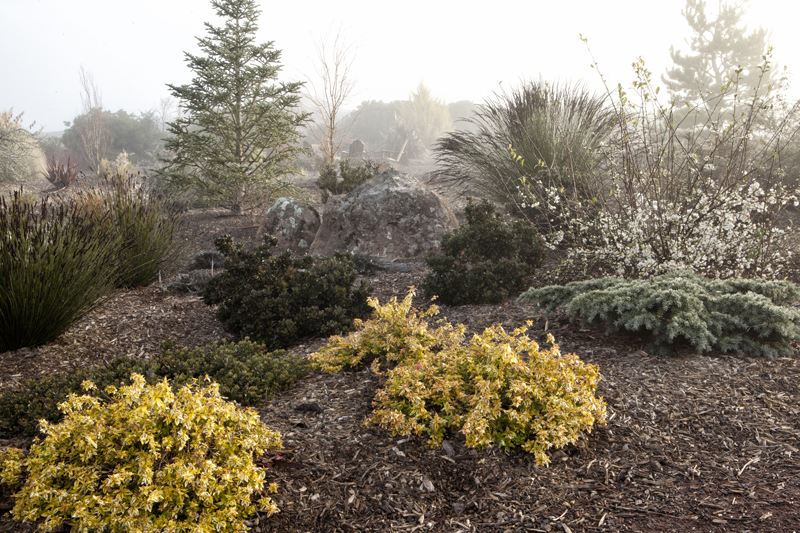 Yellow-twigged varieties such as C. ‘Silver and Gold’ and C. ‘Flaviramea’ glow with golden intensity like so many high-wattage filaments in the winter landscape. Much as we love it, we don’t plant a lot of it: the yellow color is brightest on the youngest wood, which means that yearly pruning of older branches is necessary to keep it glowing. We’ve even prospected for gold amongst the grass-like plants and found Libertia, which is woefully underused, given its attributes. Not a true grass but a member of the Iris family, Liberta is evergreen, low maintenance and drought-tolerant in Zones 7-10. There are several varieties – we’ve used L. ixiodes ‘Goldfinger’ and L. peregrinans. 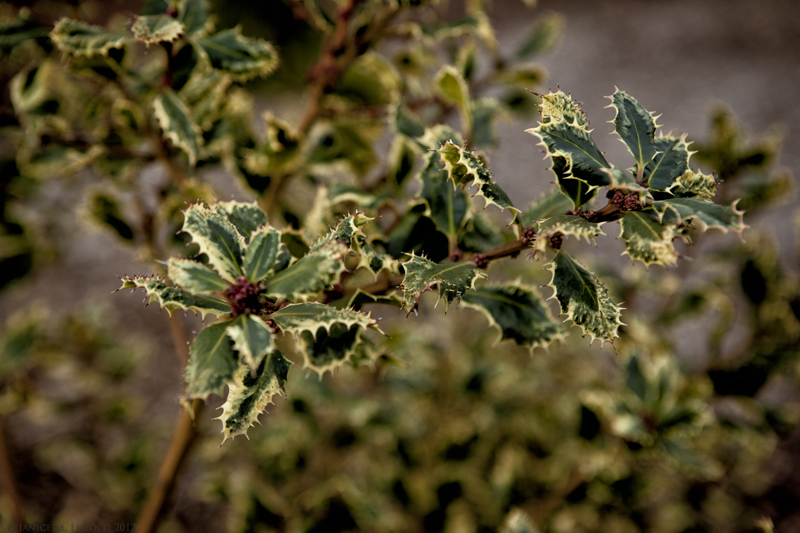 There are also variegated hollies or holly-look-alikes. 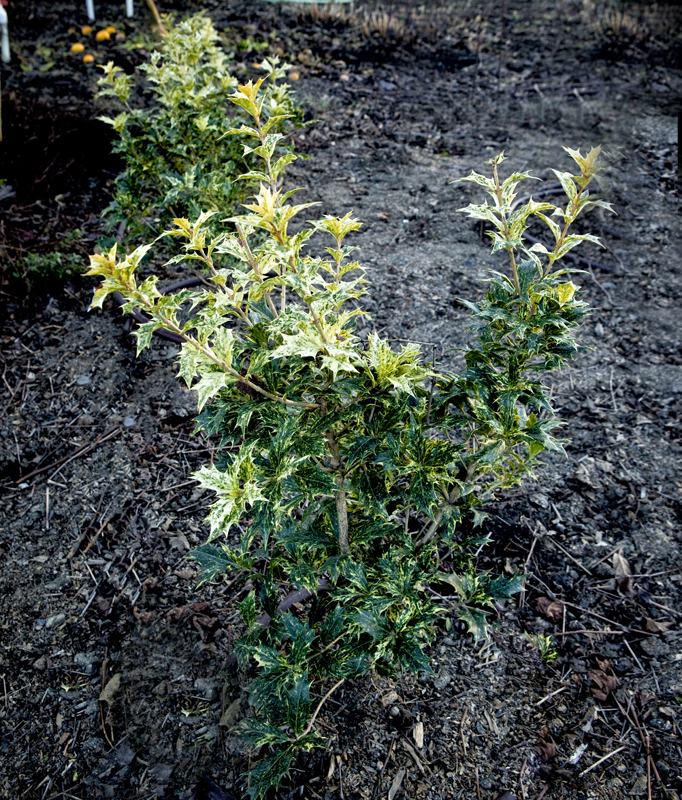 Try Ilex ‘Ferox Argentea’ or Osmanthus ‘Goshiki’. Both supposedly grow to Zone 6. Their shiny, toothy leaves add structure year-round but their golden variegation is most appreciated in winter on cloudy days. For those of you in the coldest zones, Sedum ‘Angelina’ is hardy to -40° F. We’d call it chartreuse in summer, but in fall and winter it takes on a ruddy hue and shines gold from underneath shrubs or across open spaces. Be careful about adding ‘Angelina’ willy-nilly; it roots seemingly overnight and some may consider it invasive. If you use drip irrigation, it won’t take hold where there is no water. And finally, even though we’re cheating by including this on a foliage blog, what would the winter landscape be in California without citrus? 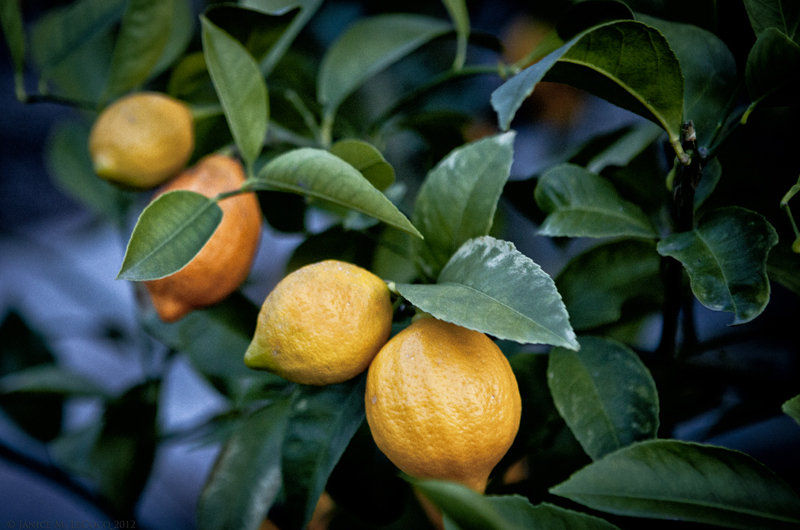 Meyer lemon (Citrus limon ‘Meyer Improved’) is the only citrus that we can reliably grow here in 9b, and it supposedly grows in Zone 8. The golden fruit add ornamentation to the winter landscape, with the added bonus that you can use them in baking, juices, etc. Doesn’t this make you want to go for the gold? Categories: Circle Oak Gardens, Design philosophy, Gold, Winter | Tags: evergreen shrubs, garden design, golden foliage, phormium, winter garden, yucca | Permalink. I just subscribed and am enjoying your pictures and comments. Thanks, Mike! We appreciate your nice words. Don’t hesitate to let us know if you have some suggestions for foliage plants that work in your zone. Your blog just gets better and better! Although I can’t plant many of the plants you feature in my Zone 4b garden, it still inspires me….I can’t wait to try out some of these ideas in my own garden next spring/summer. Keep the good stuff coming! There is nothing so enlightening as another gardener’s beauties! Thanks, Tracey! Many of the conifers will work in your zone, although not all, and not everyone is comfortable using conifers. They mix very well with perennials, though, so you don’t have to give up flowers. Do let us know if you discover a particular plant or plants that work well in your zone that fit in with the ‘form and foliage’ concept. We’ll make sure to list them so that others can benefit from your experience. Gold is not just gold! The variations, as you’ve so brilliantly shown, are amazing. It’s fascinating to see the contrasts from photo to photo. I’m not a huge gold fan, it certainly does look wonderful in your gardens. Bravo. Thanks, Sandy! It really is a winter phenomenon. A lot of these plants either appear more subdued in summer (e.g. 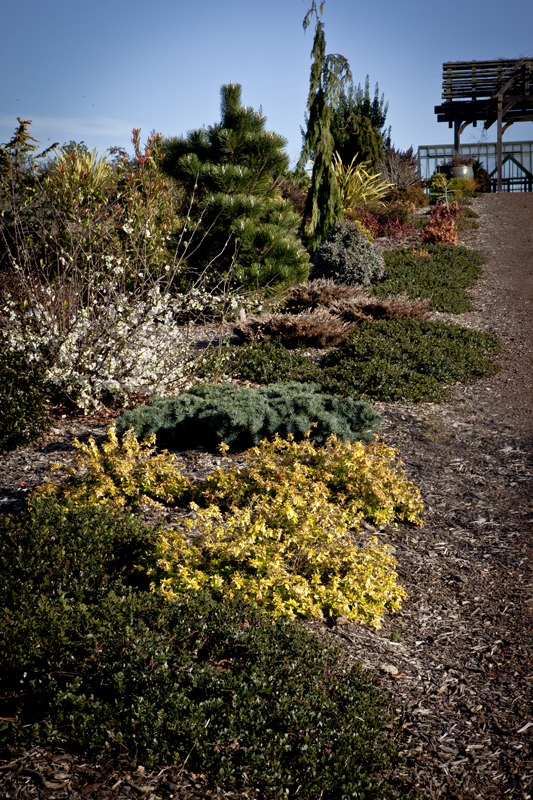 most of the conifers) or are relegated to supporting roles when eclipsed by new foliage or fall colors. Of course, in a year like this one, where it appears that winter in Northern California has been cancelled, the gold isn’t as necessary. But most years it gets me through the short, dark days. 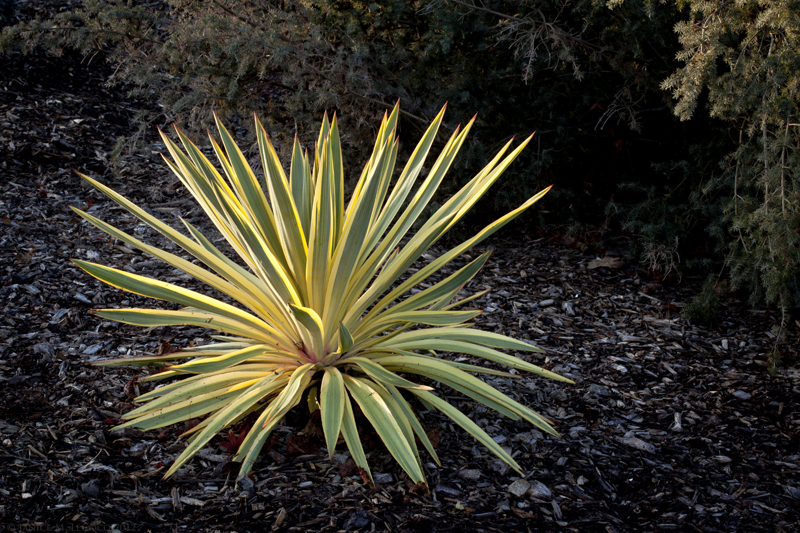 I love the photo of Yucca brightstar, it does look like a star! Also for gold foliage choisya ‘sundance’ and some of the sedges like ‘evergold’ are great. We get a lot of foliage color in the Northwest from Heucheras (Electra) as well. I really like plants in winter, they are so much more important to us than those summer movie stars that get all the attention. Oh that Choisya ‘Sundance’ is fantastic – I am going to have to look for that. Choisya does well here – I have ‘Aztec Pearl’. And good call on the Carex, too – I actually have some ‘Evergold’ but only a small plant or two. Now you have me thinking about it and a larger mass would really give some pop to shady areas. 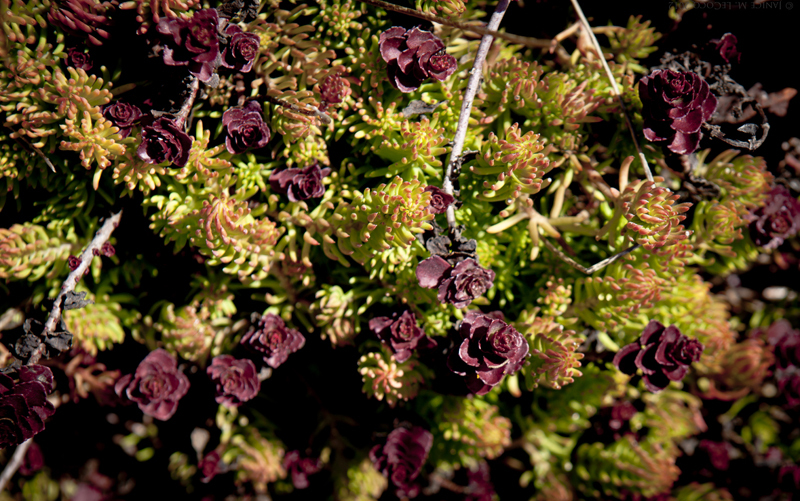 And the Heucheras as well – great ideas, keep ’em coming! Thanks, Debby! Don’t hesitate to get down and dirty with Jan and Sara! Can’t help returning after seeing this in someone else’s winter garden, hardy down to zone 5 – Poncirus trifoliata, “flying dragon.” Not edible as a fruit, but usable in marmalade… At least it looks delicious. Wow – did not know Poncirus and it looks intriguing. Those twisty branches are attractive even when bare, and there is a web image of bare branches with fruit still attached that is really eye-catching. Will have to see if it is available and give it a try. Chimonanthus (wintersweet) is so lovely in bloom; I suspect that it is not used (and I have never seen it for sale here) because it is not terribly attractive the rest of the year. However, if placed properly (near a group of plants that do command attention in spring and summer, for example) it would work fine. I too have become disenchanted with Phormiums but I have to say the ‘Golden Ray’ with the Cryptomeria make for a luscious pairing. Two more good golden shrubs we use in the PNW are Eleagnus pungens ‘Maculata’, gold-edged leaves and fragrant fall flowers and Lonicera nitida ‘Baggesen’s Gold’. Neither shrub has great form; truthfully, the Lonicera sometimes looks like it is having a bad hair day but both are tough and here in the gloomy PNW we’ll take all the wintertime cheer we can get. Thanks, Paige! So far the ‘Golden Ray’ are okay; they remain golden and variegated (it’s been about four years so far) and are easy to clean up, as the leaves pull readily with a firm tug. They do get bigger than the tag said, but that’s pretty much par for the course with Phormiums. Do not know the Eleagnus; will have to check it our. I completely concur with your assessment of the Lonicera/bad hair day – they require so much fussing to keep them in shape (I generally cut to the ground after 1-2 seasons) that I have just about finished with them. Do you grow Abelia ‘Kaleidoscope’? It’s smaller than the others we’ve been discussing but lovely color and well-behaved. Your post on springtime bloomers was great, btw. The pictures posted here have become an inspiration for me. The garden pictured in your first posts last fall has remained as my computer screen saver all winter and spring, and has inspired me to attempt my own version of a coniferous garden here in Oshawa, Ontario Canada. I am busy collecting the plants I intend to use and hope to have the bed planted by late May. 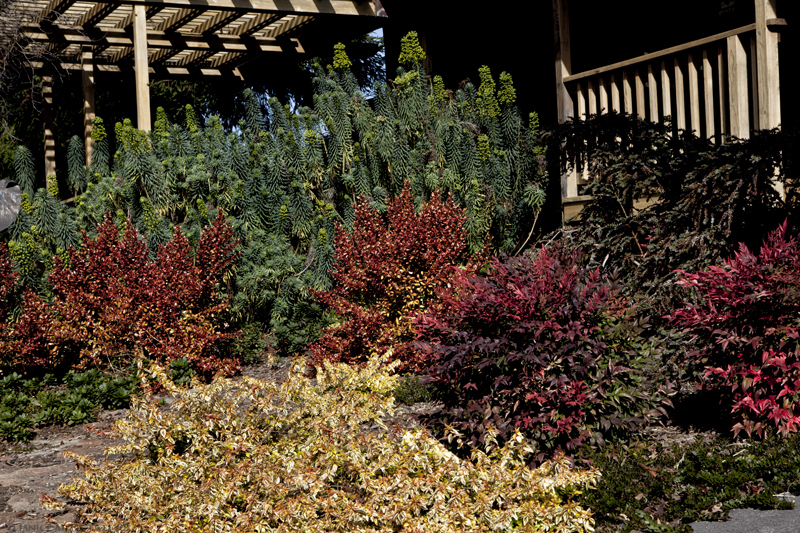 Some of the varieties I have been collecting include Chamaecyparis Pisifera cultivars and the more hardy Euphorbias such as Polychroma and ‘Bonfire’, both of which have a lovely golden hue in spring and turn a fire coloured red in fall. I also plan on using Lysimachia or Creeping golden Jenny to offset some of the greenery. Keep up with the great blog….I LOVE IT! Tracey thank you so much for your nice note! Those Chamaecyparis pisifera cultivars are gorgeous; they turn positively violet in winter. Let us know how your garden turns out and send us photos if you like – we’d love to see them! We’d also love to know which plants you end up using. Stay in touch. I did try Abelia x grandiflora ‘Kaleidoscope’ several years ago and it died. I’ve killed enough things over the years that I’m trying to remember what seemed to be the cause. I’m pretty sure not enough summer water killed it but as I recall it had partially defoliated the previous winter so I didn’t try again. I have to say when I saw your photo I thought maybe I should give it another try. I see it in the nurseries here in Seattle but haven’t noticed it in many yards. I’ll have to ask around and see how well its been holding up here. Glad you enjoyed the post. Let us know what you learn – we do water in summer, and the garden has heavy soil with a fair amount of clay in it so its water retention is quite good. I also mulch abundantly. My neighbor has an Abelia and it does just fine up here in the Cascade foothills south east of Seattle. It does lose some leaves in the coldest part of the winter, but comes right back in the Spring blooming as if nothing happened. Thanks, Mike – Paige, here is some feedback from someone closer to you than we are!